Note: The following article is purely speculative and is in no way conclusive. Having successfully rectified my own chart using the incredibly powerful Local Space astrology technique, I decided to try it on a celebrity whose birth time is much in request but is nowhere to be found(as of this writing) online. The celebrity is Sofia Vergara, an actress, model, television host, comedienne, producer, businesswoman, and almost dentist, who is best known for her role as Gloria Delgado-Pritchett in the highly popular comedy sitcom "Modern Family". I scoured the internet for her background info particularly when it came to the places she lived or traveled to as well as the important relationships in her life. The Sun signs of her parents would have been helpful in my quest but none could be found, only the date of her son Manolo(born September 16th, 1992). Miss Sofia was proudly born on July 10th, 1972, in Baranquilla, Colombia, also the hometown of famous singer Shakira. Sofia grew up and was schooled in her native hometown with the goal of becoming a dentist, but aborted that in place of acting, modeling, and performance. She hosted many Colombian TV shows until 1998 when her brother was murdered and the family decided to relocate to Miami, Florida, USA. 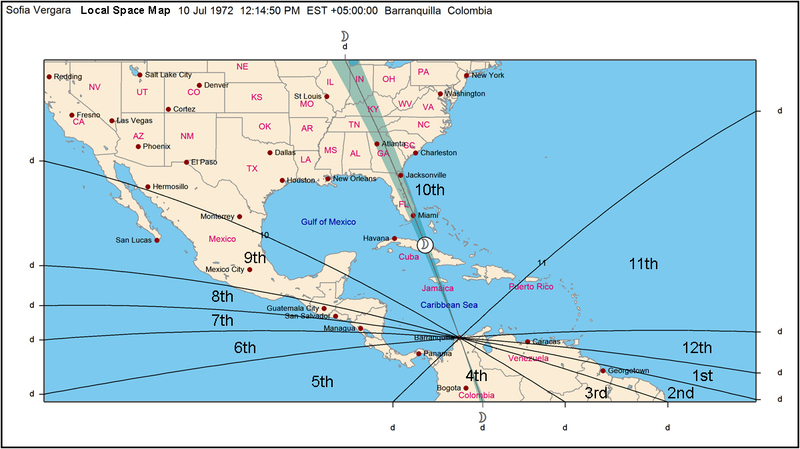 This relocation to Miami Beach Florida is particularly important and is the place I have used to rectify her chart using Local Space Astrology. I used the Janus astrolocality module as I find it is a notch above the rest in terms of line accuracy, although it sometimes has the aspect glyphs or houses in reverse. Zodiacal was used instead of mundo and a noon(midway) birth time selected to start the search. I then clicked on the rectify feature and worked forwards and backwards from noon, until the local space Moon line aligned perfectly with both Baranquilla and Miami Beach. The results were surprising. The first result yielded a birth time of 12:14:50 PM(early afternoon) Colombian standard time(no Daylight Savings Time is used there) and an Ascendant of 22Lib36 and a Midheaven of 20Can55. Using the Whole sign House system, this would put Uranus(in Libra) in her first house and the Sun and Moon(both in Cancer) in her tenth house, and Jupiter(in Capricorn) in her 4th house. 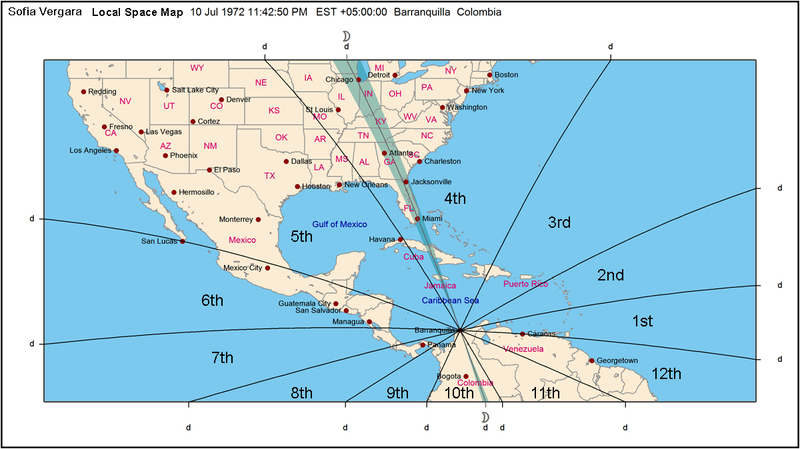 The second and only other possible result aligning the local space Moon line to both Baranqilla and Miami yielded a birth time of 11:42:50 PM(late night) Columbian standard time and an Ascendant of 17Ari51 and a Midheaven of 13Cap54. Once again, using the Whole Sign House system, this would put Uranus(in Libra) in her 7th house, Jupiter(in Capricorn) in her tenth house, and Sun and Moon(in Cancer) in her 4th house. For me, the first result makes more sense. With Uranus in the 1st, she definitely has an eccentric or "Aquarian" persona to her, with Both Sun and Moon conjunct in the 10th, she has risen to great fame and fortune, and Jupiter in the 4th explains the very large family she came from. Aries on the 7th house would also explain her close working partnership with Sun in Aries actor Ed O'Neill in the Modern Family show. So Libra Rising it is -according to Local Space Astrology. Of course I could be wrong, but many of the pieces seem to fit. Until she releases her true birth time(if she has one), we will never really know her Rising Sign with certainty.